Take a walk through Tinseltown and revisit some of you favorite movie heroes at an online casino near you. Don’t worry; these online slots aren’t soul crushing sequels, but rather adaptations of the precious originals. Lights, camera, sweet slot action! “Well, there are just some things a man can’t run away from” and this slot is one of them. John Wayne, powered by Playtech, has 5 reels and 25 paylines. This game has 2 bonus features – one being the John Wayne’s Ranch Bonus Feature where you shoot tin cans to reveal multipliers, extra free spins, scatters and wilds. Knocking off cans can lasso you up to 40 free spins and a 5x multiplier. “Whatever possessed God in heaven to make a man like Rambo?” Better question: whatever possessed iSoftbet to create this slot? Rambo is a 5-reel online slot machine that flexes 720 ways to win. Find 5 or more Golden Grenades to unleash 1 of the 4 Progressive Jackpots: Explosive, Honour, Bravery, or Stealth. Land Rambo Scatters to fight your way into the Free Spins Bonus. Here, you’ll get 10 Free Spins and a chance to pick out your own Extendable Symbol! “Like a finger pointing away to the moon. Do not concentrate on the finger or you will miss all of the heavenly glory” this slot has to offer. This 5-reel, 60-payline slot comes out fighting. Bruce Lee’s portrait appears as the game’s Wild, substituting for all symbols except the game’s Scatter – the Chest symbol. This could be your means of triggering the high-kicking Free Spins bonus mode. “Say hello to my little friend”, the Scarface slot! The original violent gangster movie is finally a 5-reel, 20-payline slot machine. It features a range of killer special features. There are Stacked Wilds, Nudge Spins and Free Spins. But your best shot at winning big comes with the Say Hello to my Little Friend Bonus. In a re-creation of the memorable film scene, a gang of killers’ storm Tony’s house. Win a cash prize for every bad guy you take out! “You’re gonna eat lightnin’ and you’re gonna crap thunder” thank to this underdog of a slot. Starring everyone’s favorite Italian, Sylvester Stallone, comes with 5 reels and 25 paylines. The soundtrack will instantly get your heart pumping, along with a stocky range of special features. 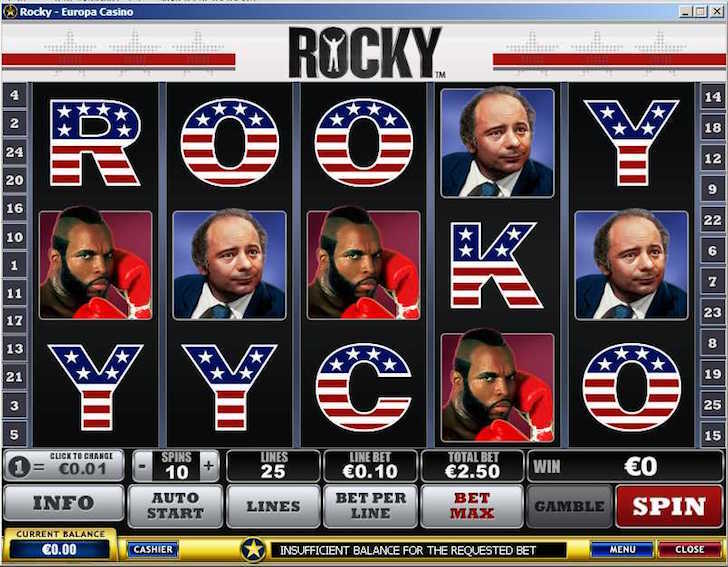 Trigger the Knockout Bonus to pick Rocky’s opponent in a 10-round fight. Every round he wins pockets you a cash prize! You’ll also benefit from a ROCKY Bonus. Spell out the Balboa’s first name across the reels with the right letter symbols to get a champion payout under your belt! There’s plenty more where these came from. Need more movie slots? Check out these other silver-screened slot gems. Turn off your phones, grab some popcorn, and get spinning!